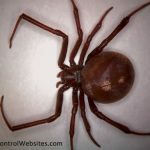 (Lactrodectus mactans) Black widow spiders are most recognized for the red hourglass shape under their abdomen. 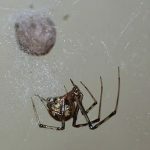 Contrary to legend, female black widow spiders rarely devour the male black widow spider after mating. 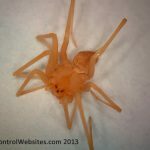 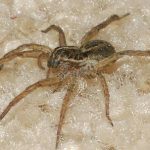 (Loxosceles reclusa) Brown recluse spiders have a characteristic dark brown violin marking on their back.